The Nest at Finch Rest: BABY BLUE EYES! Sharing pics of my sweet wee grand baby today. so thought it high time I show you how she's grown! that are being used as strap covers for her tender wee neck. so now those warmers are working to keep baby's legs warm! just happy moments just before 3 new immunizations. She cried only once for a millisecond on the second one. 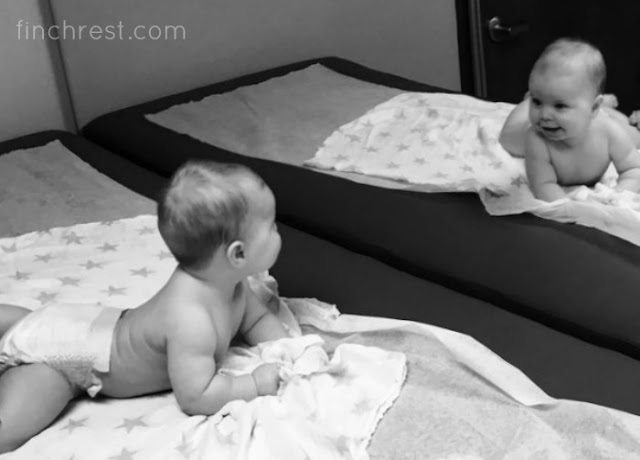 She's looking at herself in the mirror talking to that baby. "Hey! I believe I know you!" And at 6 months she is growing perfectly well. 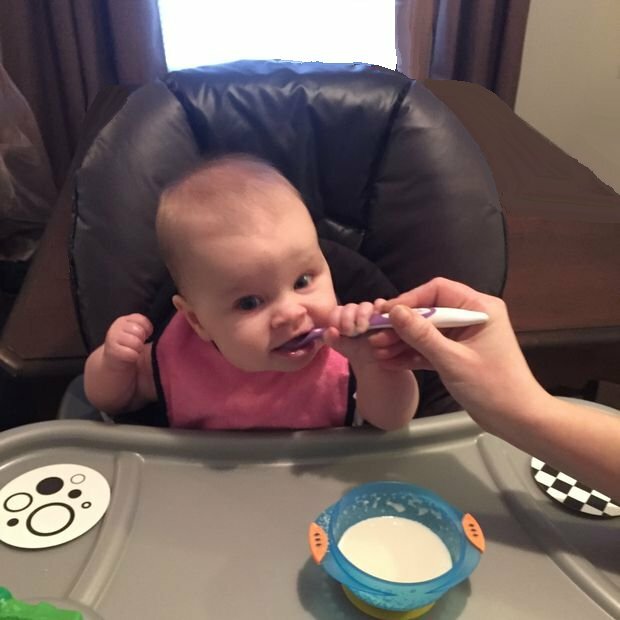 Her pediatrician gave the go-ahead to begin cereal in her diet. She's to continue nursing; also taking 6-8 ounces of formula per day. pic was taken the first time she ever ate from a spoon. Her momma says she's a natural born eater. Aren't her eyes soooooooooooo intense?!? She looks right into my soul! 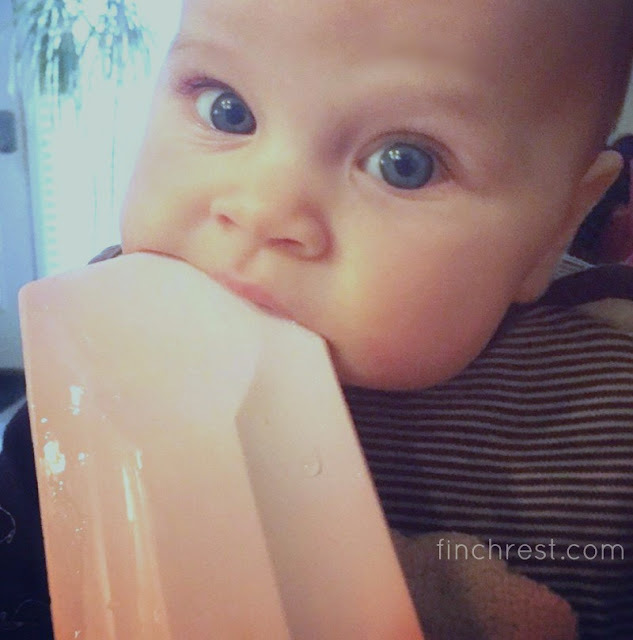 I love she is chewing on her auntie's rubber spatula. I love even more all the drool on it, haha. For all of you who asked about the Gerber Baby contest. Maybe next year she can win. Credit: All pics on this post taken by baby's Auntie Ev's phone. 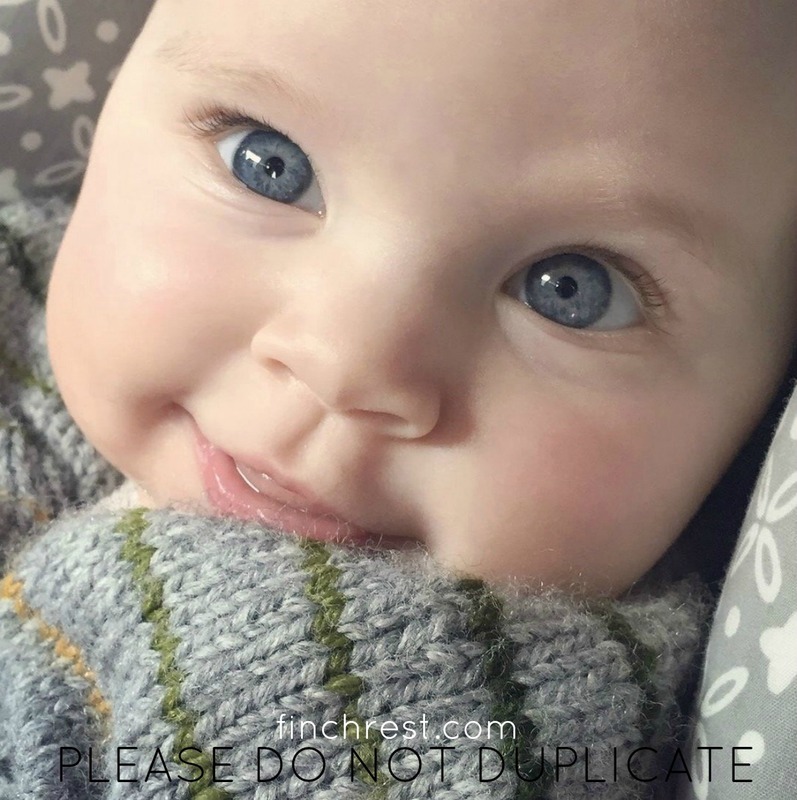 She does look like a Gerber baby with the shape of our face and those big beautiful eyes! She's a beautiful baby! Hugs! Oh, Michele! What a little doll baby! She is just adorable and what gorgeous little eyes! She could be a little movie star! Just spoil her rotten. What a sweetie! You are blessed! So much fun ahead for you and her! I can't believe your granddaughter is 6 months old already! She grows cuter every day! Michele she is just adorable. I did not know you had a granddaughter born around the same time as my granddaughter Charolotte. She is 6 months old too. We are blessed. They are such beautiful little angels in our lives. Congrats and again she is just beautiful. Six months old! Where oh where did that time go? What a little doll she is. I know she melts all your hearts. Enjoy her all you can, because the time is passing way too quickly. Thanks for sharing! She's a love and I can see how those beautiful blue eyes would look into your very being. Ahhhh...love writing like that. What a good idea for leggings...some industrious person is going to whip up some cozy omes for that very purpose. She certainly has the prettiest blue eyes doesn't she! I love how she's helping with the spoon! I'm sure you just love every minute that you get to be with her! Our little grandson just turned 4 months. I can't wait to see him again! So adorable! She's a winner to me! Her eyes are so beautifully exspressive! So clever to use the legwarmers as strap covers. Have a wonderful week! I know you are to the moon and back. Granddaughters are so special. Enjoy her as they grown up so quickly. Mine will 15 in October and I don't know where the time went. Hugs and give her a big kiss from me. Oh Michele, those blue eyes of hers just melt my heart, as I know they do yours, too. What a little beauty your granddaughter is, and she'll bring you such blessings in the years to come. My dear Michele, those eyes are absolutely captivating! Oh, what a precious and beautiful baby :) And what a joy to have her in your life. Thank you for sharing her with us through your photos. Love and hugs to you! Oh, I can't stand it. Too precious for words!! She is beautiful, her eyes are so pretty. What caught my attention was her flawless skin. You have every right to be proud. I'm still waiting to become a grandmother.